Recently we got a call from one of our editors in New York asking if we would be interested in coming down for a RainyDayRenovation project. 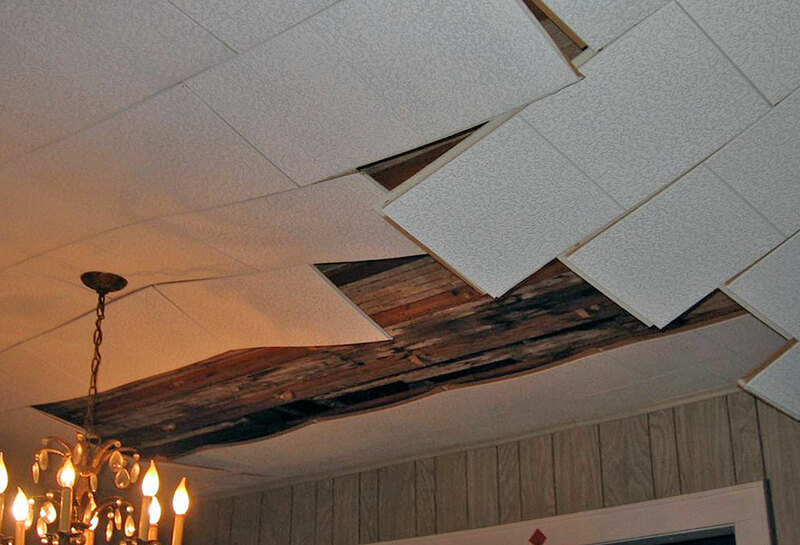 Apparently, the tiles of the ceiling in one of the rooms in their house had started to fall. The project would be to put up a new ceiling using similar tiles. The renovation looked simple enough so we said “Sure. The interns would be happy to help…provided that the materials are supplied and the interns get fed.” The RainyDayInterns go to great lengths to get out of the office, especially if there is a possibility of free food! It looked like the he ceiling tiles had started to fall because an insufficient number of staples had been used to secure each panel. The pressed-fiberboard tiles had been up for a few decades, and because of their age had begun to buckle. Since they were only suspended by just one or two staples, the tiles could no longer support their own weight and started to fall. Once one tile gave way, its started a cascading reaction because of their tongue-and-groove construction. 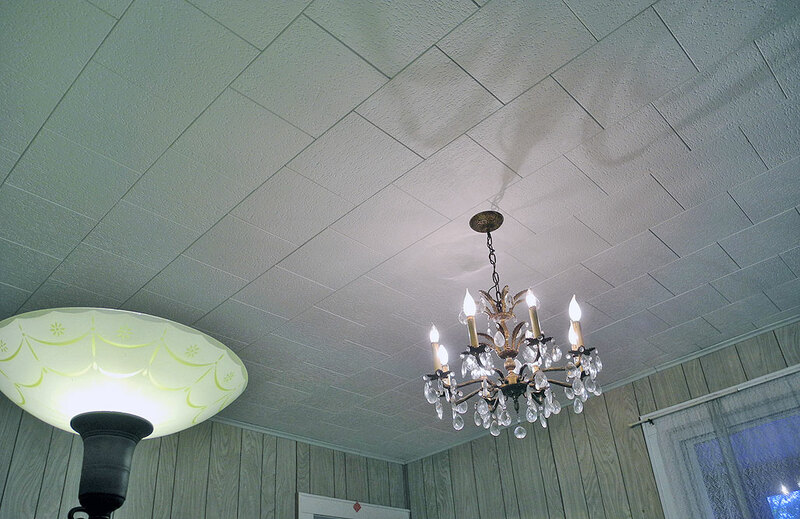 By the time we got there, most of the old ceiling had either fallen down or had been removed. There were some water stains in the wood slats, but upon closer inspection it was clear that the stains were from an old leak. Fixing the leak was probably the reason why a new ceiling was put up the last time. As no new leaks were evident and the furring strips were all in excellent condition, we were able to get to work right away removing the remaing tiles and staples. While the ceiling was being prepped, others went in search of the new replacement tiles. Their first destination was Home Depot. However, Home Depot appears to have discontinued these types of tiles because their stock was just pitifully low (a few opened boxes, mostly broken tiles). After trips to two different stores (Valley Stream, Freeport) with no success, the interns tried the Lowe’s in Rosedale. Lowe’s had three different styles, plenty of stock, and excellent prices. The Armstrong ceiling tiles came 40/box. 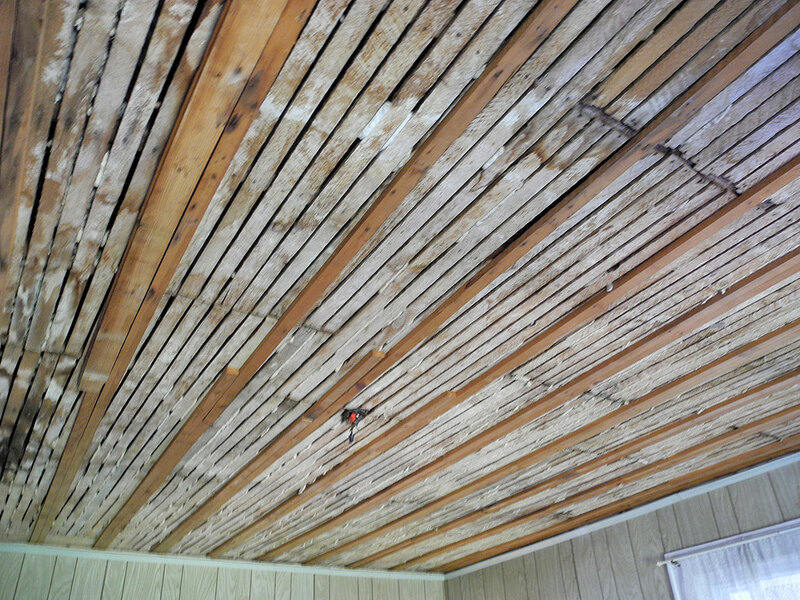 Five boxes were plenty (allowing for mistakes, damage, etc…) for the 180 sf ceiling. The tools required are pretty simple: straight edge, utility knife, staple gun. 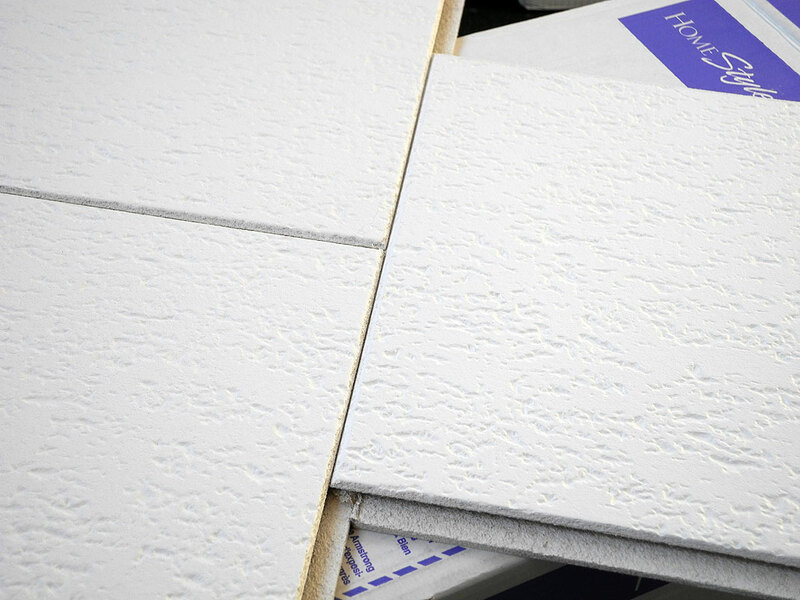 Directions for the installation of the ceiling tiles are included with each carton. As we will be installing the tiles onto existing strips, we didn’t have to spend time squaring the room or installing the furring strips. The only thing to keep in mind is that fiber-based tiles are kind of soft, so they should not be handled roughly. When they have to be trimmed, make the cut on the side facing out. Armstrong’s directions recommended a flush edge-to-edge alignment. This is the typical approach and will work just fine. However, shifts will inevitably creep in. While it is possible to compensate for small misalignments, a deviation from a straight line can be quite evident. We decided to stagger the row-to-row alignments by 6″ so that any drift could be compensated without being so obvious. The entire ceiling installation may be done by just one person, but it goes a lot faster and easier with two: one to hand the tiles up and the other on the ladder stapling the tiles to the ceiling. The critical stage of the project is the start. Care needs to be taken with the first row, as any problems will be magnified by subsequent rows. With the first row finished and usable as a guide, the rest went up much faster. The only times we had to slow down were at the ends where we had to cut the tiles to fit and when we had to cut the hole for the chandelier. We had to make sure we cut the hole small enough so that it would be covered by the lamp’s mounting plate.